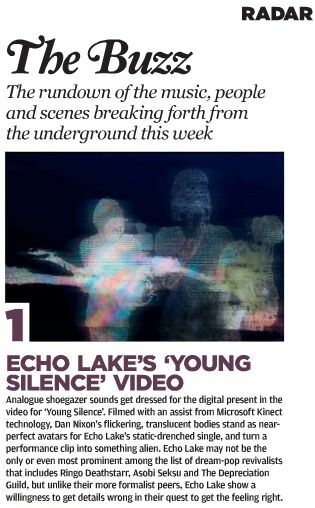 This is the video that I made for Echo Lake, that was somewhat famously shot on the Microsoft Kinect. The band were recorded separately with the Kinect plugged into a MacBook Pro. The laptop was running a piece of custom software (written in Cinder by my friend and colleague Dom Jones) that wrote out the depth and RGB images to separate ‘TIFF stacks’. Once we’d shot the footage I began to build on the work of Flight 404 (who wrote the original Kinect drivers for Cinder) to manipulate the images into one ‘world’. Without getting too far into the tech behind the whole thing, that was pretty much how it was made.